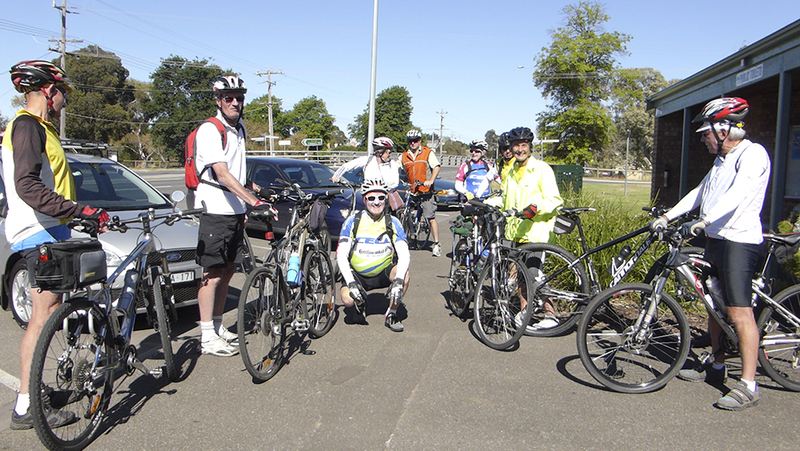 The Skipton-Ballarat rail trail ride is always a favourite with club members. Utilising the club’s bike trailer to transport some of the bikes, a group of twelve riders had a very enjoyable 60km ride on a gravel surface through picturesque countryside on 30 December. A gradual gradient saw the riders pass through a variety of terrain including remnant grasslands at both ends of the trail, rolling farmland, bushland and a tranquil forest saturated with butterflies near Linton. Of note were the many historical goldmining sites along the route, a kaolin (white clay) mine at Pittong and the impressive and historic Nimmons Bridge at Newtown. The trail caters well for cyclists with many rest stops with signage explaining the heritage and conservation value of the area being explored. The three levels of government have contributed to the capital costs and ongoing maintenence costs. Our group enjoyed a welcome stop at the Smythesdale Reserve for a picnic lunch with most riding on to Ballarat for refreshments and some remaining there for dinner. Two intrepid riders, John and Barry, decided they needed more exercise and, just out of Ballarat, they turned around and rode back to Skipton! Peter and Swee did a wonderful job accommodating everybody’s needs, which included driving some back to Skipton to retrieve their cars. The weather was perfect – warm with a slight breeze. All of the cyclists would highly recommend this ride. This entry was posted in Club events, Ride reports by hlyth2013. Bookmark the permalink.